North view of Savendroog, from Maugree. 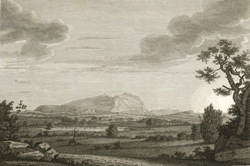 bl.uk > Online Gallery Home	> Online exhibitions	> Asia, Pacific and Africa Collections	> North view of Savendroog, from Maugree. Etching with line-engraving of a north view of Savendroog from Maugree by William Skelton (1763-1848) after sketches Robert Home (1752-1834) had made when he had accompanied the troops in Lord Cornwallis's campaign against Tipu Sultan in 1792. Plate 11 of Robert Home's 'Select Views in Mysore, the country of Tippoo Sultan' published in London in 1794. In the late 18th century, the Muslim rulers Haidar Ali (r.1761-1782) and his son Tipu Sultan (r.1782-1799) fought the British over the control of Southern India. The hillfort at Savandrug near Bangalore comprises of an enormous mass of granite. In 1791, Savandrug was successfully stormed by British forces under Cornwallis.